High-quality solders from ECO1 series offered by BROQUETAS are lead-free and they are made of Sn99.3 Cu0.7. They are widely used in electronic industry, for manual and automated device and electronic component manufacturing. Thanks to the use of modern production techniques, solders from ECO1 series guarantee high quality standards and meet the following legal requirements: UNE EN 9453:2006 (401 alloy), EN 61190-1-3:2007, REACH and RoHS directives. Solder from ECO1 series is available in the form of flux core wire (No Clean B2.1, ROM1) that conforms to the following standards: UNE EN ISO 29454-1 (1.1.2.B), J-STD-004. Available wire diameters: 0.5mm, 0.7mm, 1mm, 1.5mm, 2mm, 3mm. Available reel weights: 100g, 250g, 500g, 1000g. 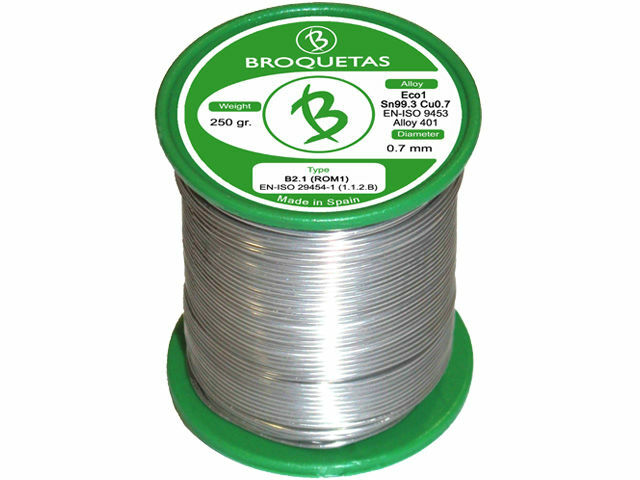 Check out full TME’s offer of solders from BROQUETAS.